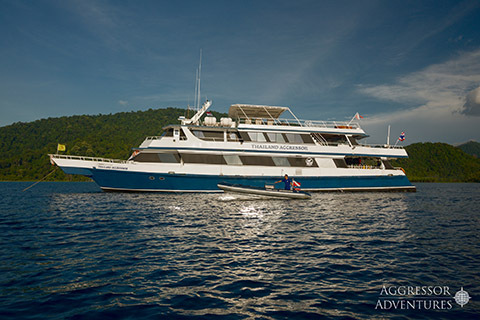 The Indo Aggressor offers multiple unique itineraries in Indonesia: Komodo Deep South, Komodo National Park, the Forgotten Islands, and an 11 night Bali-Tulamben-East Sumbawa-Komodo National Park voyage. 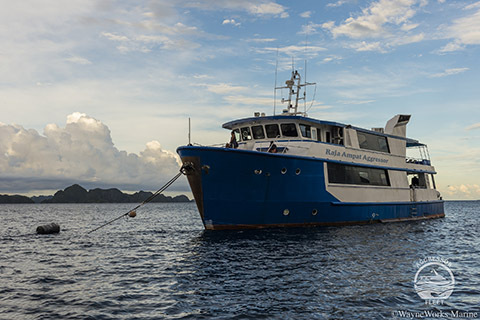 These 7, 10 and 11 night liveaboard Komodo cruises feature enhanced vacation itineraries that allows guests more time diving and more time in the signature areas. Dugongs, sharks, manta rays and at least 14 species of whales, dolphins and sea turtles call this rich environment home. Raja Ampat has the richest coral reef ecosystem in the world. More than 1200 species of fish, 600 species of coral and 669 species of mollusks inhabit the crystalline waters of Raja Ampat, Derawan Islands, and the Banda Sea. 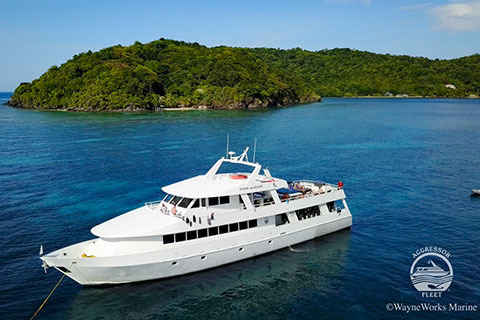 These three unique areas sample the diversity and abundance throughout the Coral Triangle of Indonesia offering 7, 10, 11 and 12 night trips. 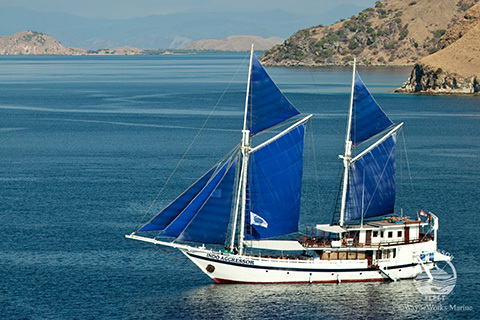 The following itineraries are offered throughout the year; Raja Ampat, Banda Sea/Raja Ampat, Banda Sea, Banda Sea/Ring of Fire, Komodo & Flores Islands, Raja Ampat/Halmahera/Lembeh and the Derawan Islands. 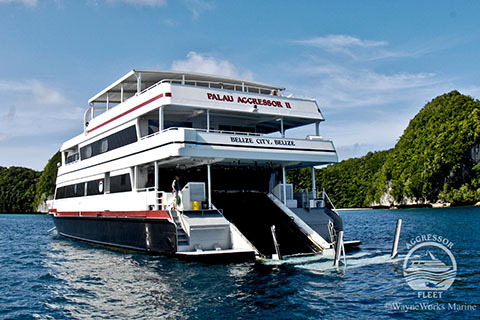 The Thailand Aggressor itinerary dives the best of Thailand in the Andaman Sea. This area is known for spectacular reefs, beautiful rock formations and colorful marine life. 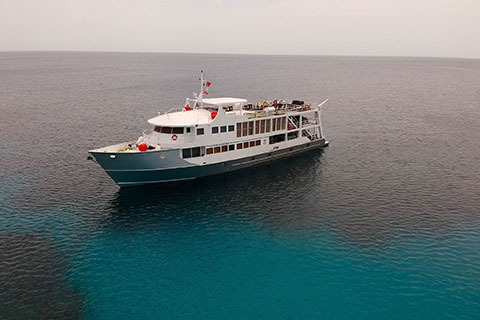 Guests will dive well known areas such as the Similan Islands, Richelieu Rock, and Phi Phi Islands which is where the warm water draws large schools of tropical fish, manta rays, and the awe inspiring whale shark. The wealth of aquatic life will delight any underwater photographer. 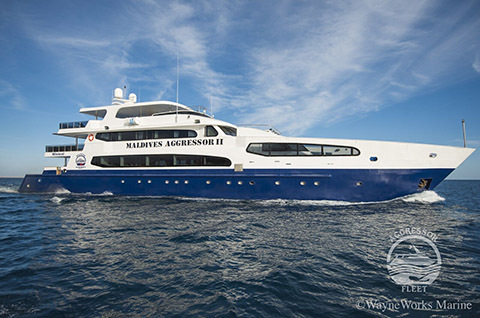 The Maldives Aggressor II offers four areas with multiple itineraries, either 7 or 10 nights; ‘Best of the Maldives’, ‘Deep South and the Southern Hemisphere. Visit our website to see detail maps of each area. 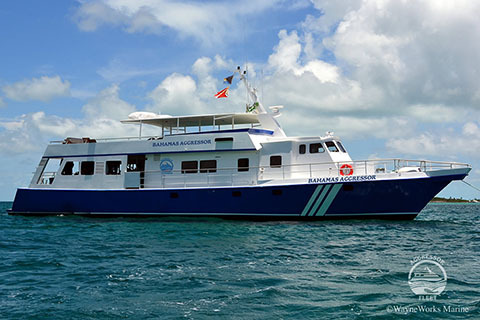 Guests will dive the many passes and channels between the gem-like islands of the Maldives which are packed with pelagic activity like manta rays, giant napoleon wrasse and whale sharks. Interior lagoons, decorated with lush soft and hard corals are teeming with macro activity. Whale sharks, hammerheads and sea lions are just a few of the species that flourish in prolific numbers due to the cool Humboldt Current. The Galapagos Aggressor has been operating in the archipelago since 1993 with a permit issued by the Galapagos National Park. 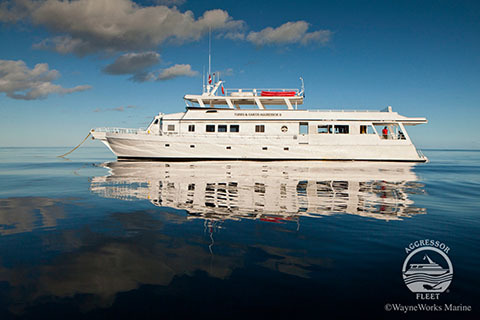 The Galapagos Aggressor departs from Baltra and travels far north to the famous Darwin and Wolf Islands for thrilling diving to see hammerhead sharks, whale sharks, clouds of tuna and much more. The Fiji Aggressor guests will depart Suva to explore the beautiful reefs, bommies and walls of Wakaya, Nigali Pass, and the Kadavu islands. 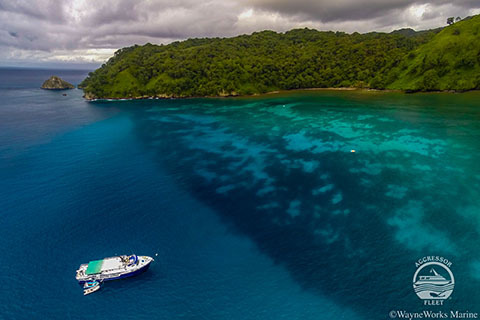 Known as the soft coral capital of the world, the brilliant colors on display will dazzle even the most experienced divers and photographers. Enjoy a visit to a local village to for traditional Fijian dancing during the week. 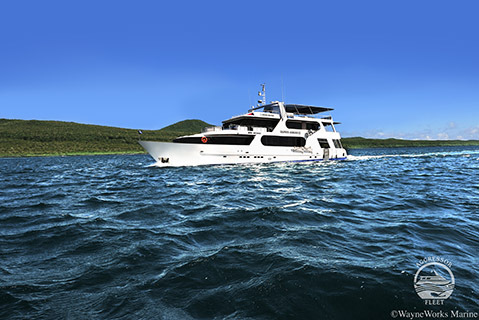 Drift dives with eagle rays, mantas, turtles, sharks, and trevally are also on the itinerary. 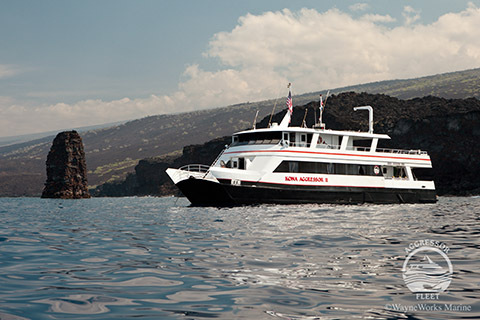 The Big Island of Hawaii’s volcanic underwater topography is a diver’s wonderland. Lava tubes, arches and huge craters create a spectacular backdrop for Hawaii’s many species like spanish dancers, turtles, mantas and frog fish. If you are looking for wild nights, then you’ll love Hawaii’s night- life! Soaring manta rays glide within feet of divers’ masks during one of Aggressor’s signature dives. 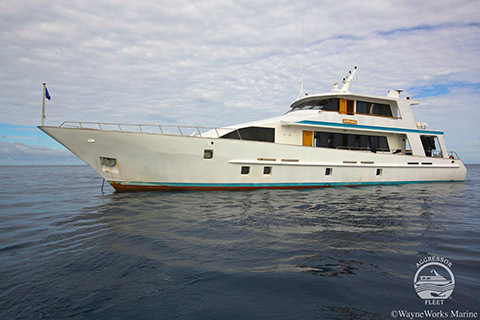 The Belize itinerary will include Turneffe and Lighthouse Reef where guests will dive sheer walls like Painted Wall, Half Moon Caye Wall and Quebrada plus the famous Blue Hole. The walls are filled with huge crimson gorgonians and giant orange elephant ear sponges. Guests will also explore the Blue Hole, a 1000-foot wide, 400-foot deep, collapsed cave system. Midweek, guests can go ashore to Half Moon Caye for a walk on the beach and a tour of the bird sanctuary. Here you can observe Red-footed Booby and Frigate Birds and a lighthouse built in 1848. Explore the dramatic walls, lush coral reefs and exciting animal encounters of the Exuma Cays Land and Sea Park. This protected area is one of the world’s most successful marine parks, with an area of 176 square miles consisting of an array of more than 350 small islands and cays. The crystal-clear tropical Atlantic pours over the deep cuts between the cays and constantly shifting sand bars. Waters are thick with coral reefs that are alive with every imaginable ocean critter from the living jewels – angelfish and butterfly fish – to the charismatic food-chain toppers like grouper and barracuda – right down to the tiniest living invertebrates. The Cayman Islands are a British Crown Colony which lies 480 miles south of Miami, nestled in the turquoise waters of the western Caribbean. The crystal clear, warm water of the Cayman Islands has made it one of the top scuba diving destinations in the world. 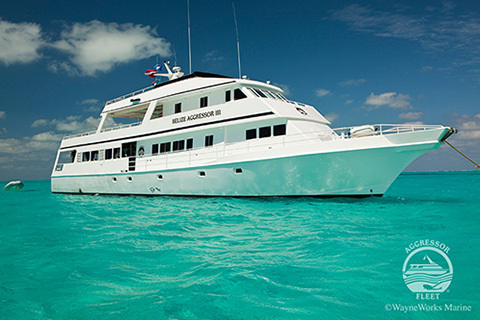 On their liveaboard trip, scuba divers will explore the walls and ship wrecks of Grand Cayman, Little Cayman and Cayman Brac (weather permitting). With awesome visibility and breath-taking soft corals, the Red Sea is one of the most popular scuba diving destinations in the world. There are over one thousand species of fish in the Red Sea, 20 percent of which can be found nowhere else in the world. It is hard to believe that where the Egyptian desert sands end, a marine paradise begins. 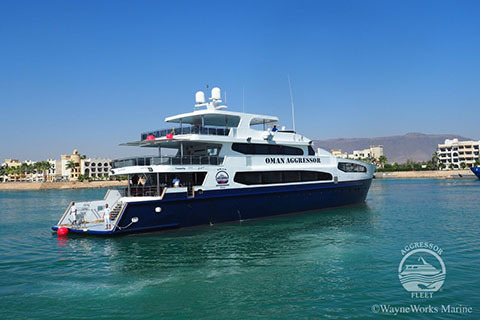 Ironically, Egypt’s desert climate has created an ideal liveaboard scuba diving setting. The Bay Islands are world-renowned for their sheer walls, mystical wrecks, massive barrel sponges and captivating macro critters. These waters are also home to larger marine species, such as Whale Sharks, Caribbean Reef Sharks and Bottlenose Dolphin. The Roatan region of Honduras has fantastic critter scuba diving with subjects like Electric Rays, Longsnout Seahorses, ferocious looking Spoon-nose Eels, Rough Box Crabs, Yellowheaded Jawfish, Sailfin Blennies and even Southern Stargazers. Thrilling wall diving along the coasts of Providenciales, West Caicos and French Caye. The sheer walls of Providenciales begin at 40 feet, plunging into the deep blue abyss and include crevasses and ledges that are decorated with huge orange Elephant Ear sponges, Gorgonians, Crimson Rope Sponges and abundant macro life. The tinerary April through December departs from Providenciales, Turks & Caicos Islands. 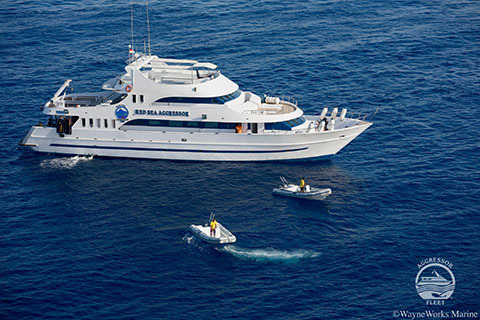 The Palau Aggressor and Rock Islands Aggressor are sisterships and have been an Aggressor Liveaboard™ vacation destination for over 25 years. Palau’s mushroom-shaped rock islands offer a variety of exciting dives: WWII wrecks, shark-infested channels, blue holes, a freshwater lake with stingless jellyfish and even a few caves. There are also sheer walls covered in lush soft corals and huge anemones.